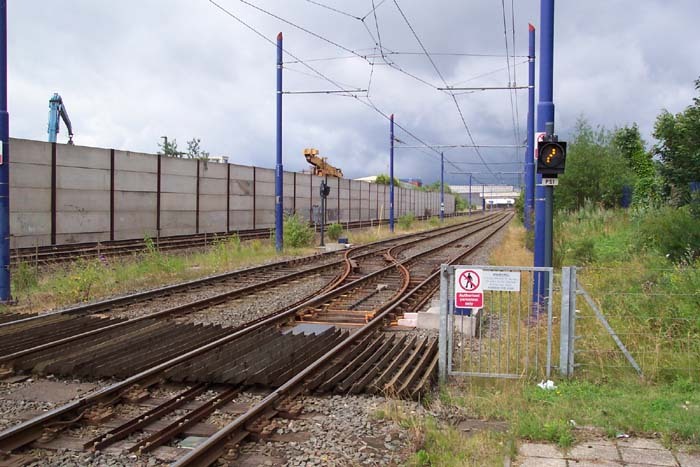 Handsworth & Smethwick station opened in 1854 on the GWR line from Snow Hill to Wolverhampton Low Level, a project originally mooted by the Birmingham Wolverhampton & Dudley Railway: a company for whom the GWR offered 'guidance' and within a short time, complete absorbtion. The BW&D's influence can be seen in the station architecture pictured above (photo: John Edgington) in 1957 in which the photographer is standing on the Wolverhampton platform. 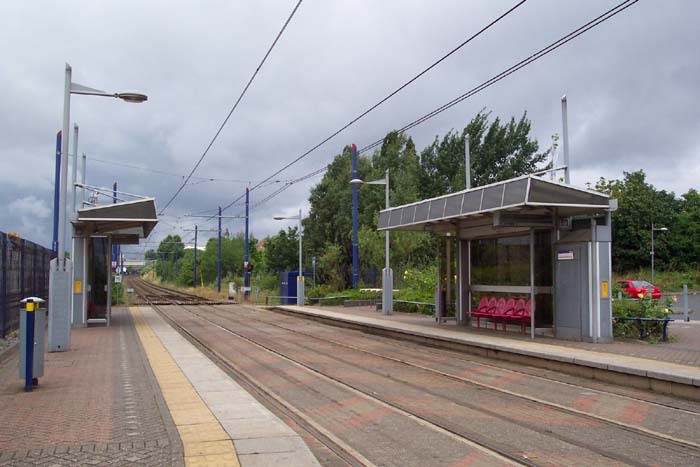 Its rigid block-like stylings are very distinctive and almost a carbon copy of their other stations on the line: West Bromwich and Wednesbury Central, for example. The station closed, along with the line, in 1972 after services being gradually run-down for the previous few years. 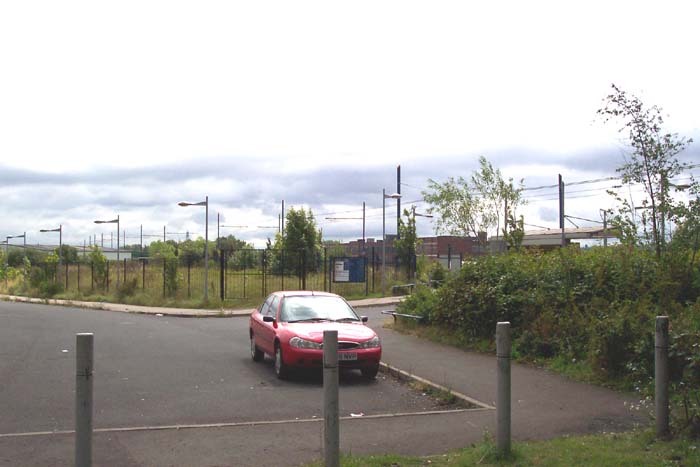 However, the site itself is now used for the Midland Metro Snow Hill to Wolverhampton St George service under the name 'Handsworth Booth Street'. Unfortunately, the site was extensively cleared pre-Metro so few clues remain as to its previous incarnation. 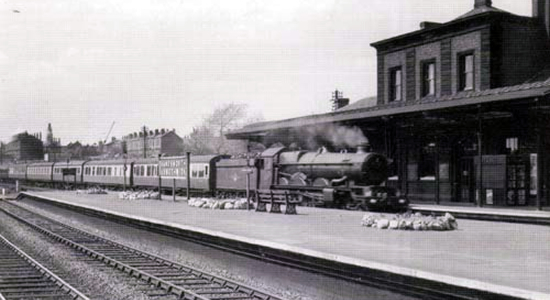 Above-left, if you imagine walking through the station building from the Birmingham platform (as shown in the 1957 photograph) and upon exiting the other side looking right, this is the view you would see down the station approach driveway to Booth Street. In the present, it appears a somewhat over-the-top driveway to a small Metro stop but is one of the few relics of the site's past. Above-right we are in the same spot but have turned 90 degrees to our right and would have been looking at the entrance to the station building from the top of the driveway. However, of course, what we now see is the somewhat less inspiring entrance to the Booth St Metro stop. 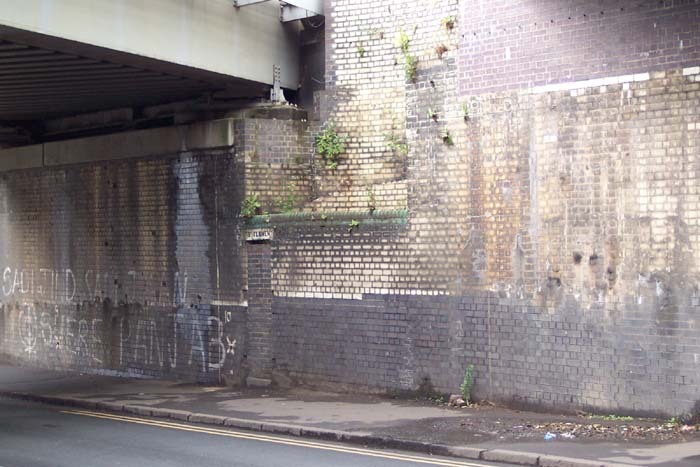 Above-left we have entered the Metro stop and are standing on what was once the Birmingham platform of the station looking towards The Hawthorns Metro stop. 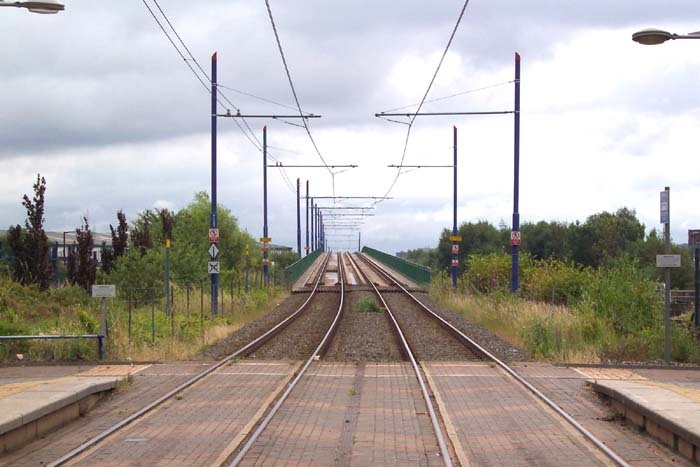 The Metro operates on what were the two Birmingham-bound lines to the right of the photograph but now they operate as a one-up and one-down track with heavy rail occuppying the two lines to the extreme left of the shot. The island platform seen separating the two-up and two-down lines in the 1957 photograph has been removed and replaced with the Wolverhampton 'platform' of the Metro stop. Above-right we are standing in the middle of the Metro tracks looking at the curious construction carrying the Metro from here to Winson Green Outer Circle Metro stop towards Birmingham. This is the 1:30 incline of the Queen's Head Viaduct. 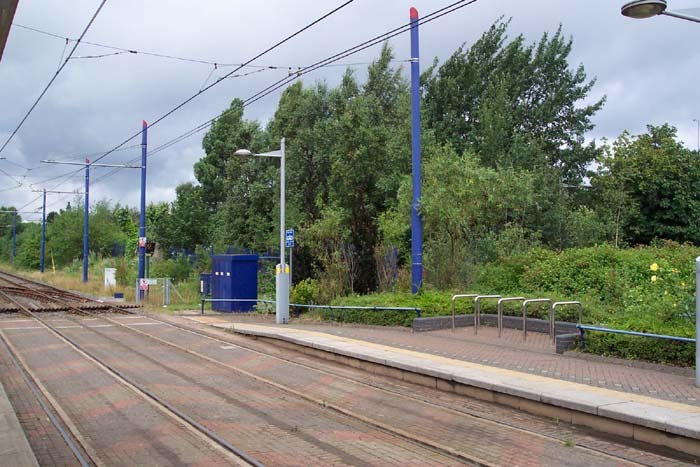 Above-left we are standing on the site of the island platform looking at the Metro stop in the direction of Wolverhampton. 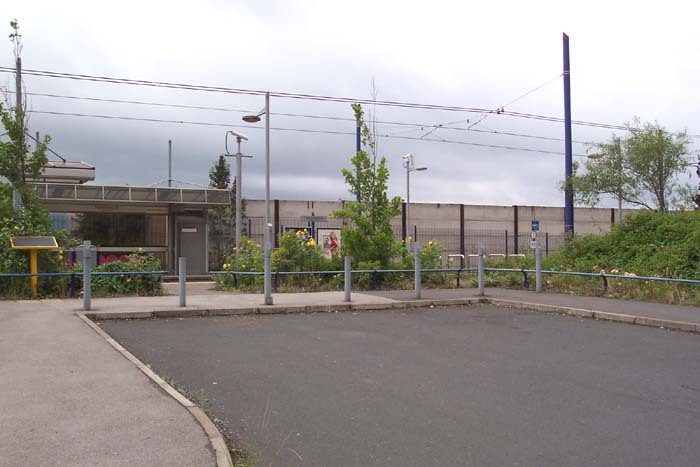 Above-right we have walked to the other end of the Wolverhampton platform of the Metro stop and are looking across the track to the spot that once housed the station building seen in the 1957 photograph: no trace of which appear today. 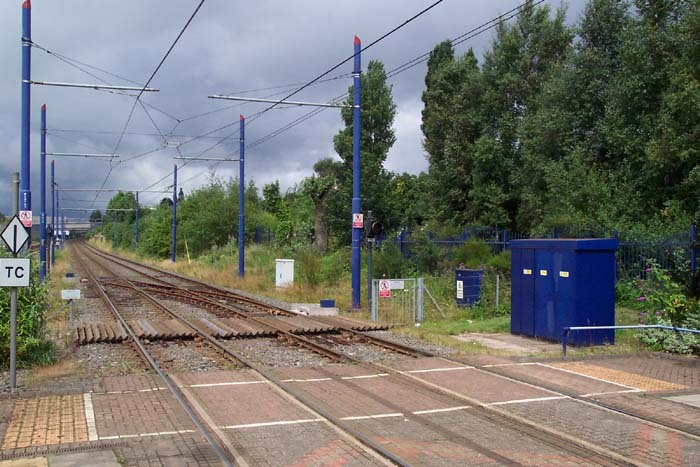 In fact, the only signifier linking the past and present site exists just before the third overhead cable post on the right-hand side of the track: the distinctive tower of Wattville Road School seen in the 1957 photograph can just be seen peeping above the trees! Above-left is a similar shot to the one previously but turning slightly to the right to provide, as close as possible, a replica of the 1957 shot. Above-right we have left the station and are standing at the top of the drive with the station site to our right. 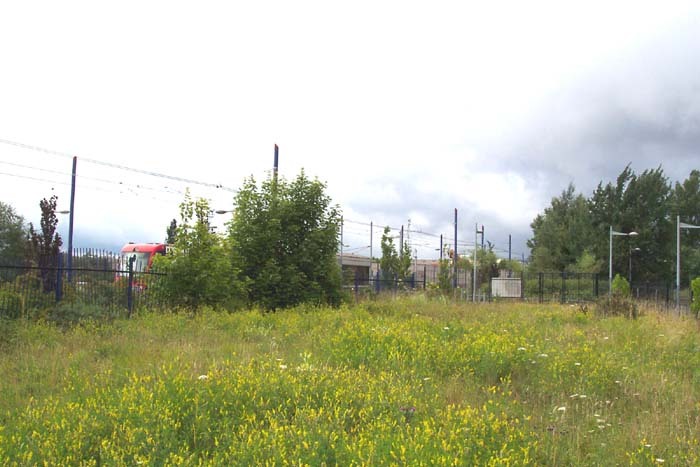 The fenced-off wasteland ahead and to the right was also part of the original station site but has been completely cleared. 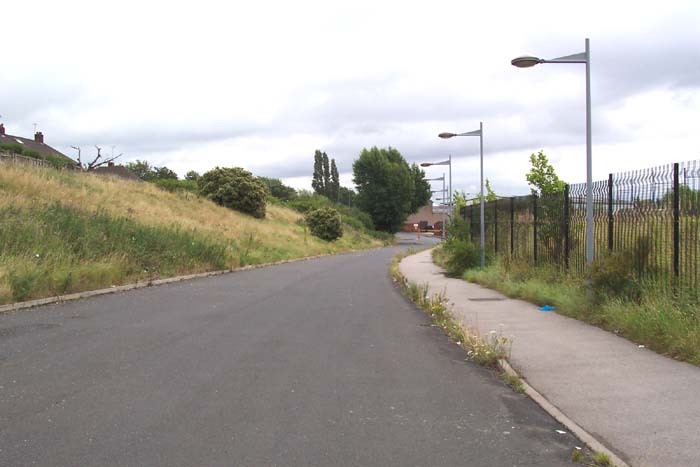 Above-left we have entered the wasteground and are looking back at the station site with the entrance driveway to our right. Above-right is an interesting relic of the site's fomer glory: we are under the bridge over Booth Street and centre-shot can be seen the bricked-up entrance to a gents toilet - an open-topped one at that! Sadly, as with most of the remaining railway public toilets, it is long-since decommissioned and where was the Ladies toilet? All-in-all, an interesting site but it has undergone, as have most of the Metro sites, a complete scouring of all its historical features which is a pity, especially considering the size of this station when operational.